The lesson from this week's best-seller list is simple: God sells. But what worries some scholars is that the hottest religious books depart from traditional Christian teaching or distort the faith's origins. The latest pulse-pounder in the "Left Behind" series about the end of the world - "Glorious Appearing" - couldn't have appeared more gloriously, at No. 1 on the fiction list of Publishers Weekly. It edges out another religion-themed novel, "The Da Vinci Code," which has ranked among the top three for 54 straight weeks. American's fiction market has never seen such a juxtaposition, says Publishers Weekly religion editor Lynn Garrett. Combined with the success of Mel Gibson's film "The Passion of the Christ" - now eighth on the U.S. all-time box office list - it makes an obvious statement. "Whether they feel negatively or positively about religion, people in American culture think about and care about it," Garrett says. Jerry Jenkins, who wrote "Glorious Appearing" with Moral Majority co-founder Rev. 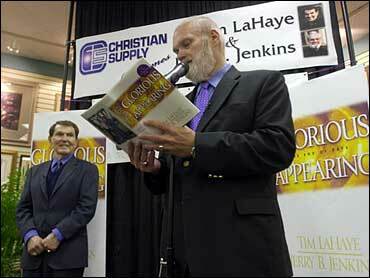 Tim LaHaye, calls the phenomenon "God hunger - people looking for something beyond themselves." Yet the success of the books troubles some critics, largely because the authors have made unusual claims that - though they employ fiction - what they're writing is true. Dan Brown's "Da Vinci Code" is a thriller whose characters malign traditional Christianity as fraudulent. But both liberal and conservative writers say it's rife with errors. Among inaccuracies they list: The characters' claims that belief in Jesus' divinity appeared in the fourth century rather than the first century; that the four New Testament Gospels became authoritative in the fourth century rather than the second century; and that the Dead Sea Scrolls and Gnostic writings (deemed heretical by the church) contain the earliest Christian records - though one Gnostic text does have some scholarly promoters. "Da Vinci" also supposes that Jesus married Mary Magdalene and sired a royal Judeo-French bloodline that still exists - and that sinister Christians suppressed information about this. The scenario comes from a 1982 book titled "Holy Blood, Holy Grail," which a New York Times reviewer called "rank nonsense." At first, "Da Vinci" drew little religious opposition because people "didn't subject it to the same kind of scrutiny they would a nonfiction book," Garrett says. But when Brown told NBC that "absolutely all of it" is true, the Rev. Darrell Bock of Dallas Theological Seminary decided the novelist wasn't just having fun but was undermining Christianity. Bock wrote the first of several Protestant attack books, "Breaking the Da Vinci Code." Roman Catholics will soon pile on with "The Da Vinci Hoax." In the foreword, Chicago's Cardinal Francis George says Brown's history is "preposterous" but must be countered because it misleads credulous readers. Brown is declining interviews. The Evangelical Lutheran Church in America has issued an adult education guide warning against Brown's plot about Christianity founded upon "lies, coverups and political intrigues." But one of that denomination's Bible professors, the Rev. Barbara Rossing, believes the "Left Behind" novels are a far worse threat, and explains why in "The Rapture Exposed." Brown's assertions are easily checked and refuted, Rossing says. Meanwhile, the "Left Behind" authors think their 12-book series depicts events of the sort the Bible predicted for Jesus' Second Coming. Indeed, "Glorious Appearing" centers on Jesus' return, which the authors expect to happen in the near future. Rossing charges that the series preaches despair, and distorts biblical teaching about the future, Mideast politics and social responsibility. To her, it "glorifies violence and war," exploits "Americans' love for disaster films and survivalist plot lines" and in general "attacks the heart of Christianity." Rossing notes that the "Left Behind" books rely on what's called Dispensationalist theology, which links prophecies from various biblical books into a complex sequence of End Times events. It's a modern innovation rejected by many Protestant denominations, Eastern Orthodoxy and Catholicism, whose U.S. hierarchy just issued a publication that assails the novels as "subtly and overtly anti-Catholic." Jenkins, however, dismisses the criticism. He reports some "Left Behind" readers have become new followers of Jesus based on the books. "A lot of people know this story, believe it and are encouraged by it," he says.